Commercial developers that manage a wide array of properties have unique needs when it comes to managing their real estate IT services. These organizations typically experience challenges related to their building-automation systems (BASs), complex systems of building-management technologies that control the electrical, mechanical, and electromechanical systems in buildings or campuses. Because property developers often manage multiple facilities, they have different networks and even different IT companies, so they typically experience more problems with their technology. In addition, commercial developers rely on complex industry-specific software to manage their properties, and while these applications can be a tremendous asset, without the necessary real estate help desk support, they can also be a costly burden. Your offices may have different service providers and disparate network configurations, yet they still need to be able to be able to communicate, share files, exchange information, and share data between and among all physical locations. Unfortunately, when multiple firms become involved in managing your real estate IT services, it's more likely that problems with the network technology will occur or, what's worse, that security vulnerabilities will be exposed. ICS has the skills and experience needed to support huge networks and reconfigure your servers and networks so that they operate seamlessly and securely. Because BASs rely on software, hardware, and servers, it's critical that these systems work flawlessly with little to no downtime, especially when the facilities that rely on them house essential services, such as medical services. ICS has the experience and knowledge needed to provide real estate IT services that are industry-specific, such as supporting and troubleshooting the massive servers and unique software that make up these systems. We also have the skills needed to design and map enterprise-class networks for new construction as well as optimally scale networks during property build-outs and upgrades. When you manage multiple commercial properties, you need real estate IT services that work for you, not against you. That's why ICS performs routine maintenance as well as scheduled build-outs and upgrades during off-peak times (such as on evenings, weekends, and holidays) to minimize or avoid the need to disrupt your tenants and/or other workers and tradesmen. At the same time, our real estate help desk is available 24/7, with average response times of 15 minutes or less, to address problems, repair networks, provide application support, and more. We also understand that the nature of your business means you're managing multiple properties in many different locations. Thanks to remote-access technology, you can travel between locations without worry. In the event of a problem or need that requires our support, we can gain entry to your network and your devices - no matter where you are. We immediately begin troubleshooting, enabling you and your employees to get back up and running much more quickly. 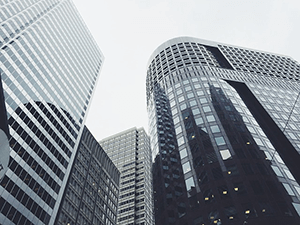 Commercial property developers rely on third-party software applications such as Sage 300 Construction and Real Estate, MRI Real Estate Software, and Yardi to monitor properties, manage inventory, oversee projects, track accounts, and more. Software built specifically for property developers can be a boon for your organization, boosting efficiency and streamlining operations. But without the proper real estate help desk support, these applications can become sources of frustration and waste precious time. Third-party software must be configured properly, maintained, and updated regularly in order to make the most of your application investment. Similar to our construction IT services, we can install your software, work with the publishers to apply fixes to any existing bugs, and even call them on your behalf in the event of an unknown issue. Not only do we ensure that any third-party software you employ is used to maximum advantage, our real estate IT services engineers also ensure your network and server has enough capacity to support your applications. With enterprise-class real estate IT services from ICS, you'll be able to manage and monitor multiple disparate facilities more quickly and easily, providing real-time support and responsivity to your clients. Want to maximize revenues, improve service delivery, and run your business more efficiently? Call ICS today to learn more about our specialized IT services for commercial property developers and investors.